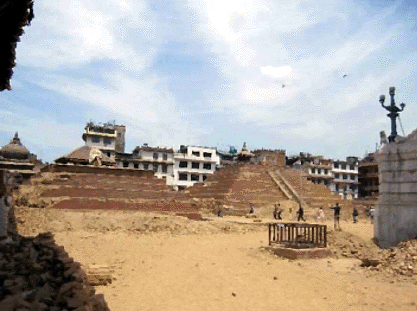 The Yadava dynasty's presence in Nepal, and the events that preceded and followed. 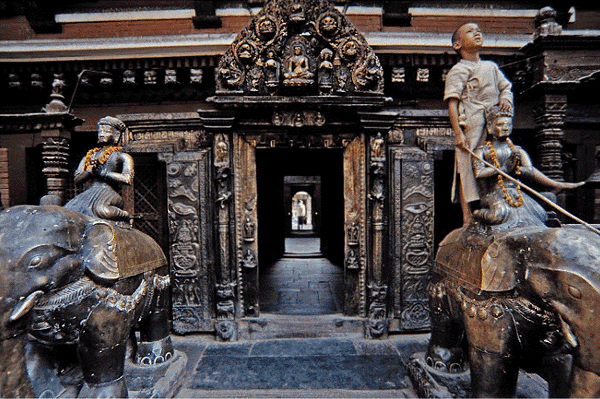 In The History of Stone Art in Nepal by Sudeep Prajapati and Para Limbu, we read: "The history of Nepalese stone sculpture goes back at least two thousand years according to Lain Singh Bangdel, author of "The Early Sculptures of Nepal." The survival of the oldest sculpture in the country indicates that stone sculpting was among the first art forms to have developed in the country. Unlike the lasting quality of stonework, samples of wood and terra cotta that have been found in Nepal date back only to the seventeenth century. The oldest stone image is that of the Yaksha Bodhisattva, which dates back to the first century AD. It was found at Hadigaon and is preserved at the country's National Museum in Kathmandu. Except for this sculpture, all others dating from the first century to the end of the fourth century AD are of a lesser size, are roughly carved and are coarsely formed. The author of The Art of Nepal, Stella Kramrisch, explains the recognized origin of sculpting in the Kathmandu Valley. It is believed that during the reign of King Vrishdeva, the great grandfather of King Manadeva, a farmer named Balbala made a self-portrait in stone for the first time. He soon gained recognition in his community due to his experimentation in this new field and, thus, he founded the art of sculpting in the country. During the time of the Gopalas, also known as the cow herders and the earliest settlers of the Kathmandu Valley, stone sculpting was uncommonly practiced. Even at this time, there seems to have been some influence from the Southern sculpting tradition of what is now India in Nepal. The stone sculptures found here during the early centuries seem to be reminiscent of a similar craft to those found in Mathura. Old stone works found in both countries share a similarity in stances, expressions, coiffures, ornaments, and decorations. Sculptures in the Varada mudra art from, a gesture of charity that is easily distinguished by the awkward right hand, cupped palm, and long disproportional fingers, are most common in the early stone art of Nepal, mainly from the second and third centuries. Examples of the Varada mudra art form are Vishnu of Hadigoan, Shiva of Balambu, Kumari of Balkhu, the mother goddess from Haugal Bahal, and Hari Hara of Saugal. Unlike the Brahmanical sculptures, some Buddhist sculptures of male deities from later centuries possess these features as well. Different earpieces, armlets, bracelets, anklets, styles of halos, folds of garments, manners of sash, and many others are the distinguishing features that classify the variety of art forms found in stone sculptures. For example, the sculptures of female deities like the mother goddess from Haugal Bahal and Vaisnavi from Kirtipur (third century) have a central form that rises from their heads; this may be an ornament that was worn during that century. Their hair is also parted in the middle with tresses falling from both sides of the forehead. This trend in hairstyle can only be seen in sculptures from the early centuries and seems to have become lost by the Licchavi, Thakuri, or Malla periods. Brahman sculptures formed during and after the fourth century can be seen holding a round object, which represents a fruit, in their right hands, known as Hamsaya mudra. This trait in stone sculpting continued throughout the Licchavi, Thakuri, Malla and Shah dynasties. Changes took place with the arrival of the Licchavi kings in the fourth century who reigned until late into the ninth century. Towards the end of the fourth century, craftsmen in Nepal slowly abandoned the Mathura sculpting style and developed their own stylistic traits based on local values and traditions. The earlier bulky forms were replaced by stylized curves, sophisticated artistry, and good proportions allowing for the stone sculpture to develop in size and craftsmanship. The Licchavis, who originally migrated from the south of Nepal, brought along with them the fashion of Gupta sculpting from North India. That is why the images from the Licchavi era during the fifth and sixth centuries show great similarity to the work of the Gupta sculptors. Likewise, those of the latter century show similar characteristics to the Pala sculptures of Eastern India. Thus, during the time of the Licchavis, stone sculpting entered a new phase. The sculptures of that period began to have finer details and, in time, the valley's artisans slowly developed their own style of sculpting derived from the Indian tradition. The Licchavi kings contributed much to the growth of the stone art form in Nepal. The oldest stone inscription found in the valley dates back to King Mana Deva during the fifth century AD. Until now, more than 189 Licchavi stone inscriptions have been retrieved and translated. By the end of the fifth century, the sculptures of Nepal began showing increased finesse and intricate details, as one can observe in the sculpture of Vishnu Vikaranta of Lazimpat and Tilganga. During King Amsuvarma's time (seventh century), stone sculpting had become highly developed and later on, King Vishnugupta carried out an order to have three huge sculptures made over a decade. Jalasayan Narayana at Budhanilkantha (641) and Mrigasthali Pasupatinatha (640) are two of these sculptures. The craftsmen of the Licchavi period were highly gifted in their profession. Among all the traditional art forms of Nepal, they have, without a doubt, showed their greatest workmanship in stone carving. Even now, craftsmen of today have not been able to copy some of the sculptures of the Licchavi era; so intricately shaped were the produce of their labour. Even today's craftsmen have not been able to copy some of the sculptures of the Licchavi era; so intricately shaped were the products of their labour. The carvings of several chaityas (Buddhist religious monuments) that date back to the fifth century display the enormous talent of these sculptors belonging to that era. Later, their stone works would serve as prototypes in the Thakuri and Malla dynasties that followed. Stone sculptures experienced a lull in their production during the transition period between the decline of the Licchavi reign and the rise of the Malla rulers (879-1200). During this time, old, abraded, and broken down sculptures of deities were replaced by new ones according to the present fashion. Damaged sculptures were taken out from their original place and plastered in new locations such as the walls of temples, water sprouts, and other unlikely places. Some idols which were once highly revered were left neglected in subsequent centuries. The sculpture of Yaksha Bodhisattva found in Hadigaon is one such example. Some chaityas were emulated during the transition period and some, like the Chaturmukha Chaitya of Swayambhu and Tapahiti, are dated between the seventh to the ninth century. The few sculptures that were made during this time show more of a Nepalese stone carving style than the Gupta style that was popular during the Licchavi era. The sculpture of Maya Devi (ninth century) in Deo-Patan, however, is very different from the sculptures of that era found around the rest of the country. This idol shows a resemblance to the sculptures of Bihar from the eighth to the ninth century. With the onset of the Malla reign around the thirteenth century, stone sculpting became popular once again. 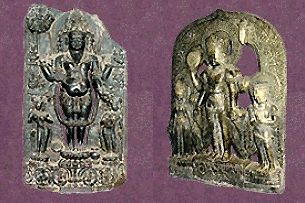 There were many sculptures of deities based on tantric manuscripts. Some chaityas such as the Chahabil Chaitya were made during this era as well as a monument of Durga (fourteenth century) which was found at Kavache Tol, Bhaktapur. Besides giving orders for their own creations, the Malla Kings also worked to preserve older stone works. King Pratap Malla recovered and installed the Kalabhairava (height 13 feet) at Basantapur and the three Jalasayana Narayanas at Hanuman Dhoka, Budhanilkantha, and Balaju. He also found two sculptures of the Licchavi period north Kathmandu. One was a Garuda and the other a 91-inch high magnificient Kaliyadamana. During his reign, he ordered his craftsmen to emulate Vishnu as Narasimha in Nasal Chowk. The Malla kings also had stone pillars put up in front of temples to show their devotion to the gods. Some examples of their dedication are the pillars in front of the Taleju Temple. When the Kathmandu Valley became divided into different kingdoms (Kathmandu, Bhaktapur, and Patan) under three Malla kings, competitions grew between the three cities regarding their wealth of architectural monuments and art items. So highly protective did they feel about this issue that they even had the hands of talented artisans cut off; they feared that the artisans would be stolen by their neighbouring kingdoms where they would be instructed to create similar if not greater works of beauty. Legend has it that King Bhupatindra Malla was greatly impressed by the sculpture of Ugracandadevi (1707) and he had the right hand of the sculptor cut off. However, the sculptor remained determined and went on to carve an image of Bhairava with his left hand, which was eventually amputated as well. But undeterred, it is said that he used his feet to make yet another piece of work which, sadly, is still lost today.